Cashback of Rs. 1000 off on any Round-Trip from Kolkata, Mumbai and Bangalore!! Use the code "GMCKOLCB" to redeem cashback for Round-Trip from Kolkata. Use the code "GMCMUBCB" to redeem cashback for Round-Trip from Mumbai. Use the code "GMCBANCB" to redeem cashback for Round-Trip from Bangalore. Cashback of Rs. 1000 off on any Round-Trip from Kolkata, Bangalore and Mumbai! Offer valid on outstation Round-Trip bookings made with GetMeCab only. 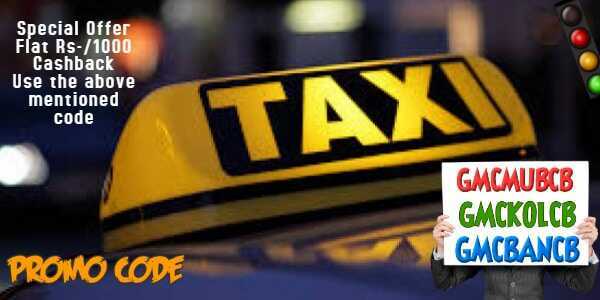 This offer cannot be clubbed with any other offer at GetMeCab or market promotions by GetMeCab. GetMeCab reserves the right to amend/withdraw/add all or any of the terms and conditions concerning this offer at any time without any prior notice. 20% of the wallet amount can be used in single Booking. Cashback can be used for payment while booking taxis only on GetMeCab and is deducted against the total payable amount/advance amount while booking the cab. Cashback is only valid for online payment at GetMeCab, and cannot be adjusted against the cash payable to the driver during your trip. The offer is valid on all Round-Trip bookings through GetMeCab website and mobile app. Valid only for Round Trips from Kolkata, Bangalore and Mumbai.